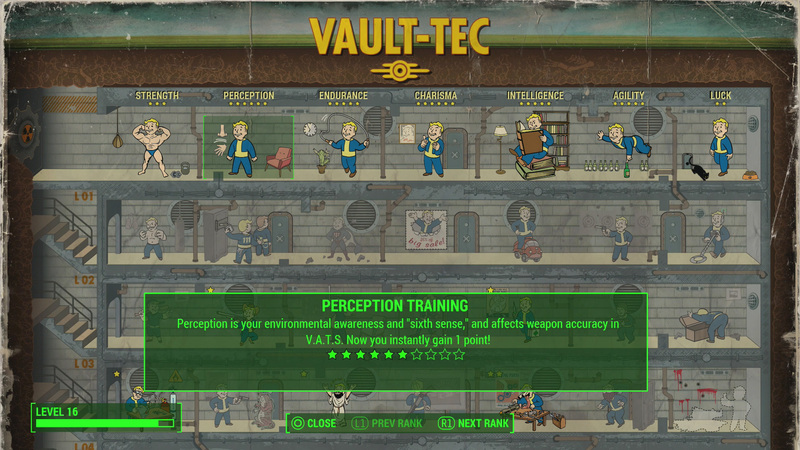 Fallout 4: How to Use V.A.T.S. Use V.A.T.S. wisely to slay foes in style. The Vault-Tec Assisted Targeting System, also known as V.A.T.S., was introduced in Fallout 3 as a unique method for eliminating enemies by stopping time and initiating a series of critical hits. In Fallout 4, V.A.T.S. have returned with a few modifications, causing players to be less dependent on this feature this time around. Since V.A.T.S. can be a bit confusing to use at first, we’ve put together this guide to help you learn the ins-and-outs of this interesting, time-altering mechanic. For more Fallout 4 guides, tips, and tricks, head over to our Fallout 4 guides walkthrough hub, containing a wealth of quest walkthroughs and item locations. In previous Fallout installments, V.A.T.S. would freeze time, allowing players to select certain hit points on an enemy that would destroy the foe with a few gory critical hits. However, this mechanic became easily abused, as many players treated V.A.T.S. as a type of pause button, taking the thrill out of enemy engagements. In Fallout 4, V.AT.S. are still used as a means to target specific body parts on an enemy to strategically take them down. However, this mechanic no longer freezes time, but instead slows down time long enough for players to decide how to strike. Initiating V.A.T.S. during combat causes time to slow down significantly. A series of boxes appear around the body of a target that allow players to queue up a shot to those body parts. To bring up V.A.T.S., press Q on PC, L1 on PS4, or LB on Xbox One. While time is slowed, select one or more of the numbered boxes that appear around the target to fire at those areas. The numbers indicate the percentage of chance you have for successfully hitting those parts. Also, hovering over each box will show the amount of potential damage to be done on the life bar of the target. Remember, V.A.T.S. only slow down time, meaning there is a limited time window for targeting your enemy. When ready, press Accept to perform the attack. In Fallout 4, V.A.T.S. also require the use of Action Points (AP). Action Points are essentially your character’s stamina level. Performing actions that consume AP, such as sprinting, powerful melee attacks, and V.A.T.S. strikes, will cause AP to drain from the bar in the lower right corner of the display. AP must recharge before performing more stamina-intensive actions. In V.A.T.S., selecting the boxes to queue up your shots will indicate the amount of AP required to perform each shot. Note that a single hit box can be targeted multiple times if AP is available. Also, using VATS while wearing Power Armor will cause the suit’s Fusion Core to drain energy much more quickly. Try to refrain from doing actions that require AP while wearing your Power Armor suit. V.A.T.S. use Action Points, so keep an eye on your AP meter, especially when wearing Power Armor. 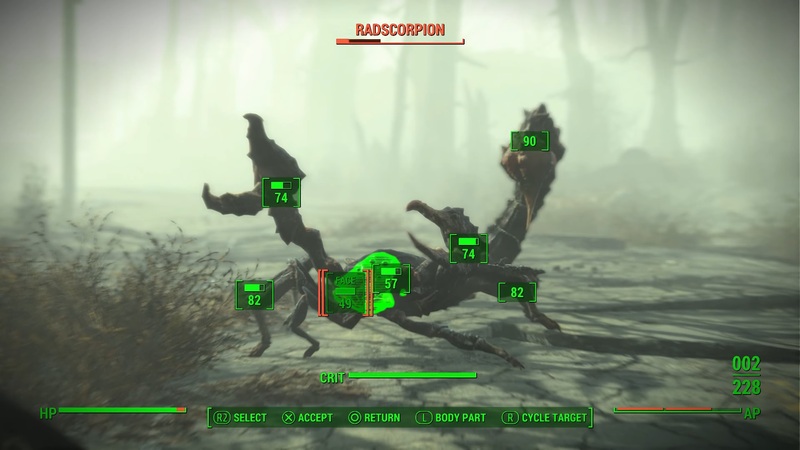 Critical hits are no longer random in Fallout. Instead, criticals must be charged and are now controlled by the player to greatly increase the damage done to an opponent. The critical charge meter will be indicated on the screen upon performing an attack in V.A.T.S. When prompted, press Execute Critical to perform a critical attack if desired. Multiple enemies can also be targeted in the same series of actions. Select the desired boxes on the first enemy, then cycle to another target to do the same. This will cause your character to execute shots to each target in sequence. The goal is to select parts that yield the most damage per shot for the best percentage of chance. Head and torso shots tend to deal the most damage, but every enemy is different. High damage hits are usually the best choice, but even targeting limbs to disable your opponent can make the engagement a bit more fun. Increase ranks in Perception and Luck perks to unlock perks related to V.A.T.S. Penetrator – Target enemies behind cover in V.A.T.S. Mysterious Stranger – A stranger can appear to help when using V.A.T.S. If you plan to use V.A.T.S. often, consider investing in the Perception and Luck perk columns, as these contain the most perks pertaining to V.A.T.S. attributes. For a detailed list of perks and their effects, check out our Fallout 4 Perk Guide. V.A.T.S. are a unique mechanic that adds variety to combat, pushing Fallout 4 beyond the limits of being just a mere shooter. Experiment with V.A.T.S. to get a feel for what it has to offer, and enjoy the gore-filled outcome. Tagged with Bethesda,	Guides,	Larryn Bell.